Planning a whitewater rafting trip? There are several options for camping near or on the Middle Fork American. A few public campgrounds are located in nearby Foresthill. 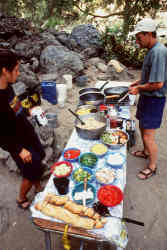 Primitive campsites are available in Auburn State Recreation Area by reservation. Wilderness camping (camping outside of designated camping areas) can be enjoyed in the river canyon by obtaining a Wilderness Camping Permit. Five primitive campgrounds are available in the Auburn Recreation Area, with a 30 day total camping limit. Camping fees are $7-9.00 per night, with additional vehicles charged $5.00 each. There is also a $1.00 fee charged per dog per night. (Dogs must be on a leash or secured inside a vehicle or tent at all times.) Fires are allowed in fire pits, where provided. For more information about the several primitive campsites, visit the California State Parks Website.